“To all the people that say they want to work but can’t find a job or don’t have a vehicle all I can say is you don’t want it bad enough!” Mitchell wrote on the Facebook post. Mitchell then used his post as a springboard to raise money to buy a car for Korva, who is 20. It took less than 30 hours to raise $5,500. Samee Dowlatshahi, the owner of a pizza restaurant who had set up a donation box for Korva’s transportation inside his establishment, contacted a friend at a local Toyota dealership. The friend told his boss about Korva, and persuaded the dealership to drop the price of a white 2004 Toyota Camry. This allowed Mitchell’s group to buy the car, pay Korva’s insurance for a year, and finance two years’ worth of oil changes along with a $500 gas card. “Are you serious?” Korva said as Mitchell handed him the keys. This is an old story, but I’ve never written about it, and I need to be reminded that there is good in the world. In the mid 1970s, Moises Treves was a day cook at a small taco stand on the island of Cozumel, Mexico, By all accounts he made the best tacos in town, and American tourist Judy Anderson, a school teacher who visited the island several times, was a special fan of them. On one visit in 1977, Judy, traveling alone as usual, invited him to accompany her to the Mayan pyramids in the Yucatan Peninsula. Moises happily agreed and served as her tour guide. They had lunch, speaking as best they could to each other using Judy’s limited Spanish and Moises’ broken English. During the meal, Judy asked Moises if he had any ambition to open his own restaurant. Ah, he said, that was his dream, but he despaired of it ever coming true. He just didn’t have the money, and couldn’t seem to save anything. Judy responded,”Such is life!,” an expression that Moises had never heard. He asked Judy about it, and the saying stuck in his mind. As the lovely day came to a close, the two friends said goodbye: Moises was about to take the ferry back to the Cozumel, and Judy was heading o the airport and then home to United States. Mysteriously, Judy gave Moises a sealed envelope and told him not to open it until he was home. On his blog, Virgin Airlines tycoon Richard Branson told a story, reputedly true, that show vividly how kindness and ethical conduct can have far-reaching consequences. It was done. The couple learned that a mysterious benefactor had paid for their romantic rendezvous, and Shah received his usual pleasure from the random act of kindness. the “dude just got down on one knee and proposed.” He asked the aspiring groom why they he had chosen his restaurant for this life-changing ritual, and was told that three years ago, at the same table, some stranger had paid for their meal right out of the blue. The gesture made the couple ponder on the importance of kindness, selflessness and love, and had talked about the incident many times since. He said both he and his girlfriend had been inspired to be better, more caring, ethical people as a result, and he felt that the place where this epiphanal event occurred would be the perfect place to propose. The manager introduced them to Shah, who attended their wedding. It seems that the couple has preferred to stay anonymous, and hell, I don’t know if the story is really true. 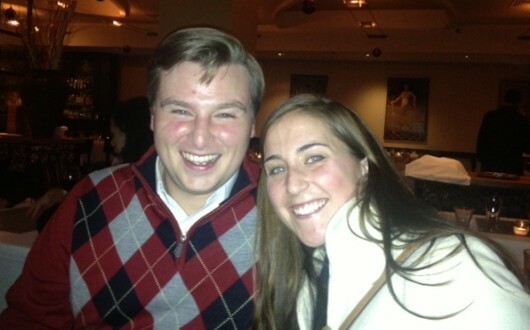 That couple in the photo on Branson’s blog may be friends of Manti Te’o, if you get my meaning. But I hope it is true. It should be. And its lesson is true, regardless.